Yesterday, for a bit of a practice run, I took three buckets of blooms from Dahlia Haven into the lovely Davina at Vida Flores to see what she could whip them up into. All I can say is: ooooooooh! (And ahhh… I wish my arms were as thin and toned as Davina’s colleague in these photos). 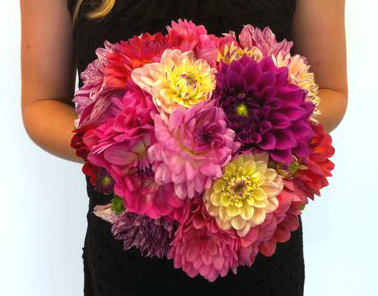 I love the pink bouquet! (Bottom photo). It must really cut down the florists bill when you supply your own blooms! Growing your own flowers is definitely cheaper in the long run, but given how much I’ve spent panic planting flowers in my wedding garden this summer, I think the only way to have saved money would have been to have eloped! Good luck with the plans, my wedding 3 years ago was meant to be in a beautiful country garden that I look after, but the one day thur that long hot dry summer of that year it rained on our day and we got married in the implement shed in a ring of petals instead. It was a truly magical day still and the rain stopped enough for guest to wander thur the garden. If it rains we will have to think of an emergency plan B (I’m guessing it will involve cleaning out the big shed in the paddock…) but I figure that given that it has rained for the past three weekends, and it’s raining again this weekend, surely our chances of getting a fine day are improving with each cyclone?? Here’s hoping! Whatever the weather brings I know it will be a truly magical day for you!! Thanks Katrina. I’m sure it will be too. We planted 100 more petunias, impatiens and daisies yesterday so the garden is now officially planted. The bridesmaids celebrated with a bottle of bubbles. I might have to pay for them all to get manicures now to get all the dirt out from under their fingernails. Dahlias are pretty good as cut flowers actually, provided you pick them before they’re fully blown. We made bouquets from them at NZ Gardener a couple of years ago and they held up beautifully for a day long photoshoot. And if they don’t, then I’ll just scatter my own petals as I walk up the aisle and pretend it’s a new bohemian trend! Funnily enough, my 3-year-old niece Grace watched my sister’s wedding DVD for the first time this month and promptly burst into tears. She wanted to know why she wasn’t invited to the party. Trying to explain to her that she didn’t actually exist 10 years ago proved too tricky, so my sister fobbed her off with the “you were in my tummy at the time” line. We’ll take lots of photos. Wow….Luv your chat (or blog,whatever you “young-uns” call it these days)??? We have just celebrated our 50th Anniversary here in Motueka.We are formally from the Countryside of Paremoremo,Albany so fully appreciate the Country life. Tis pretty Awesome here though. Cant wait to see your Wedding shots, Im sure they will be just Awesome.Country Life is in our blood. Go Girl, Your Day will be Perfect in whatever form it takes. Thanks for all your Fun Chat………..
50 years! That’s impressive – congratulations! The Hunk & I will be the ripe old age of 86 at our golden wedding anniversary… heh. Hi Lynda. I got married a week ago today (just before the storm hit) and I would have loved to have a dahlia bouquet. I saw a lovely bunch of purple/red dahlias with ribbon wrapped around the long stems and thought they looked beautiful, they did not end up going with our theme. I ended up having a mixture of roses, calla lillies and camelias all in the same shade of red with some hyperium (sp?) berries to lighten it all up and they looked stunning. Good luck for the wedding prep, enjoy it. Thanks!! My bouquet was a stunner, I also forgot to add that it had carnations in it. I never would have dreamt of having carnations in a bridal bouquet. Married life to be honest is no different then what it was like before hand. It is nice to have had our big day and share it with our friends and family. It is interesting being back at work now, everyone is so excited for me and hugs all round. One thing I have to admit is that it is kinda fun having to do your new signature for things. If someone had suggested I’d even consider asparagus fern in mine, I would have laughed. But I think it could just be perfect to have a big tail of fluffy green trailing out one side. Carnations must surely be due a comeback? I’ve planted quite a few dianthus this summer, in raspberry colours. I hadn’t even thought about getting a new signature… heh. 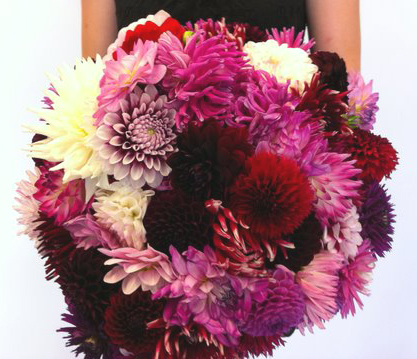 Love the first bouquet, never been a big fan of dahlias but looking at that lovely lot makes me want to plant some in my garden. All the best for your big day, may lots of butterfly’s be in your garden and the sun shines brightly on you all and all your wishes come true. Actually there are a LOT of butterflies in my garden now, but they’re all cabbage whites. We dragged a truckload of topsoil out of one of the paddocks to even up the garden on one side of the lawn… and now it’s infiltrated with some sort of weedy wild brassica. Maybe an old fodder beet or a wild parsnip or something? Not sure, but whatever it is… it’s easy to spot because of all the cabbage white butterflies hanging around it. For once, they’re behaving as beneficial bugs! I just love these Dahlias!. After seeing the article in NZ Gardener magazine about Dahlia Haven, I’m now a convert! This is my second season of trying to grow Dahlias on the side of the hills at Eastbourne, Wellington. I have quality…but not quantity yet! When you have time in the future, I would love to hear how your day went. Forgot to tick reply in my first comments of praise and wedding wishes.